Yesterday we learned that Ford would bring back buttons to their infotainment systems. The world cheered, I did not. Unlike most of the media, who spend a few days with a car, I’ve had the joy of living with MyFord Touch for almost a full year. I can promise you this; the problem has never been a lack of buttons. Adding buttons is like buying a smaller refrigerator in hopes of losing weight. It sounds good, but it doesn’t really get at the root of the problem: what exactly are you putting in the fridge? In the case of MyFord Touch, what's behind the screen? Buttons are nice to have, but if the operating system and hardware behind MyFord Touch remains the same, will the buttons really do anyting to solve the larger problems? In my 10 months of ownership I’ve had constant problems with MyFord Touch. The screen has gone black while driving a few times. Every once and awhile the text of my radio stations disappear. When I shift into reverse, I’m sometimes reminded that I don’t have a backup camera. At which point I politely (i.e. screaming four-letter profanities) remind MyFord Touch that a backup camera wasn’t even optional on my car and reluctantly I press the OK button. Two days ago the car decided it no longer wanted to connect to my phone (iPhone 5). Nothing had changed on my phone and up until that point it worked, kind of. My phone always disconnected when leaving my house. I believe when the phone switches from WiFi to LTE it interrupts the Bluetooth connection. A Ford service rep told me it was likely my phone. Thankfully only a handful of people own iPhone5s (sarcasm). This never happens in my wife’s car which is also a Ford and is equipped with SYNC, but lacks MyFord Touch. The latency of the screen is why the world is demanding buttons, not because they just have a burning desire to push buttons. If that were true, the iPad would be sitting on shelves as buyers demanded Apple add buttons to it. Why isn’t that happening? The iPad works and MyFord Touch does not. It really is that simple. Why did I opt for MyFord Touch? One word – Recaro. Ford packaged one of the most attractive aspects of the Focus ST, the Recaro racing seats, with the least desired option, MyFord Touch. The ultimate performance experience also meant having the ultimate failure in automotive infotainment. Yesterday, Ford released a press release titled “SYNC and MyFord Touch Sold on 79 Percent of New Ford Vehicles, New Technology Drives Quality Satisfaction.” Ford went on to say that “MyFord Touch mix of 55 percent” in many new vehicles. Looking at my situation, I would have never opted for MyFord Touch if it weren’t packaged with the Recaro seats. Ford’s assertion that people are buying MyFord Touch is like saying 98% of buyers opt for cars with 4 wheels. 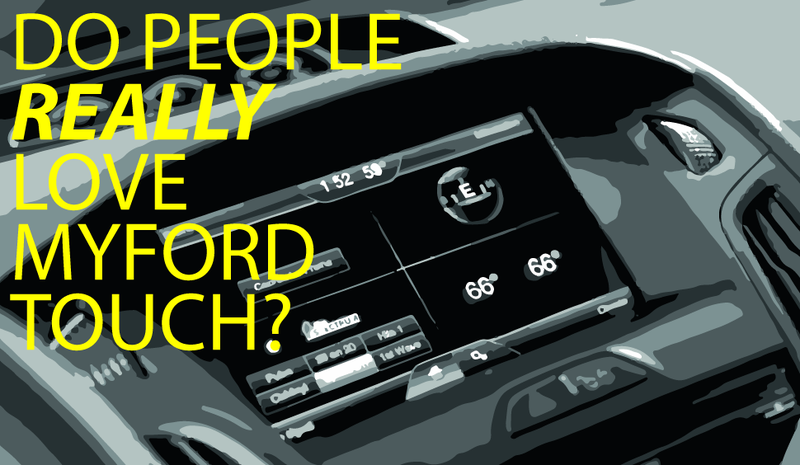 I don’t buy that people are buying MyFord Touch. Instead, I think people are buying cars and because of packaging are being forced to accept MyFord Touch.